Published: Jan. 14, 2013 at 09:48 a.m. 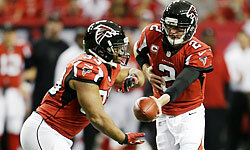 Updated: Jan. 14, 2013 at 10:00 p.m.
You can slice up a playoff loss so many different ways; there's never just one reason a team like the Seattle Seahawks lost by two points to the Atlanta Falcons. But when Pete Carroll looks at the film from Sunday's heartbreaker, he'll know that his team's lack of a pass rush hurt badly. The Seahawks' defense didn't force a punt until midway through the fourth quarter. The Seahawks registered one "quarterback hit" and zero sacks in 35 drop-backs. With the game on the line, Carroll had no faith he could get pressure Falcons quarterback Matt Ryan with his front four. The video above of Atlanta's final two completions proves instructive. The Seahawks rushed five men both times. Seattle's blitzer, safety Winston Guy, was late on the first blitz, and the Falcons picked it up easily. Falcons receiver Harry Douglas ultimately beat Seahawks cornerback Brandon Browner for a big gain. On the second completion, the Seahawks sent two players from the secondary. Guy rushed again, as did cornerback Marcus Trufant. The blitz design worked better on this play, but Falcons running back Jacquizz Rodgers did a terrific job stopping Trufant. Ryan found Tony Gonzalez open. Those two plays essentially ended Seattle's season. Carroll felt that he had to send an extra rusher because he couldn't get pressure on Ryan otherwise. He couldn't even trust his vaunted secondary to finish the job. Carroll said the team "absolutely" missed their injured top pass rusher Chris Clemons. "How could you not?" Carroll said, via the Tacoma News Tribune. "He's our best player in rushing the passer for three years. So of course we did. Mike Morgan had to play. Mike hasn't rushed the passer 10 snaps in his career. So that's how we went with it." Atlanta's players and their scheme were simply better on those final two plays. That made the difference in sending the Seahawks home for the offseason.